The extent to which social mobility differ across countries is subject of much debate in political and academic circles. The two poles of the relatively egalitarian Scandinavian countries and the relatively unequal Anglo-Saxon ones have been taken as key examples to corroborate a simple human capital-based explanation of cross-country differences in social mobility. In fact, stark differences in educational systems (e.g. private vs. public financing) and returns to skills well account for the gap in social mobility between Scandinavian and Anglo-Saxon countries. However, in a recent paper using comparable individual data for these four countries (i.e. EUSILC), I show that this explanation does not suffice in accounting for differences in social mobility across the four largest EU economies: Germany, France, Italy and Spain. To gauge insight on the validity of the human capital story, we observe that worker’s skills on which earnings depend are the result of two inputs: family background (including genetic transmission of intelligence if any) and individual abilities independent on family background. Our working hypothesis is that these two inputs are complements and thus that coming from a good family pays especially for talented individuals who not only don’t face any spatial and financial constraint to access best schools but are also exposed to a more stimulating cultural environment (Cunha and Heckman, 2007). We test this hypothesis using regression techniques that allow to estimate returns to family background conditional on individual abilities (Firpo et al., 2009). The figure below shows the effect of family background in correspondence of each decile of the son’s earnings distribution, with a higher decile corresponding to higher individual abilities. The parental background coefficient should be interpreted as the percentage increase in earnings following a one-decile increase in the relative social position of the parents. At a first glance, our results lend to support to the hypothesis of a widespread background-ability complementarity. Returns to family background are higher at the top of the distribution not only in Germany and France, where parental influence on education is particularly important because of, respectively, the early tracking and the grandes écoles system, but also in the two Mediterranean countries, where usually non-meritocratic mechanisms are stronger. However, one model does not fully fit all. First, the curve of returns to background is significantly steeper in the two central European countries than in the two Mediterranean countries, consistent with the idea that in Mediterranean countries family background affects children career prospects through social networks and nepotism. 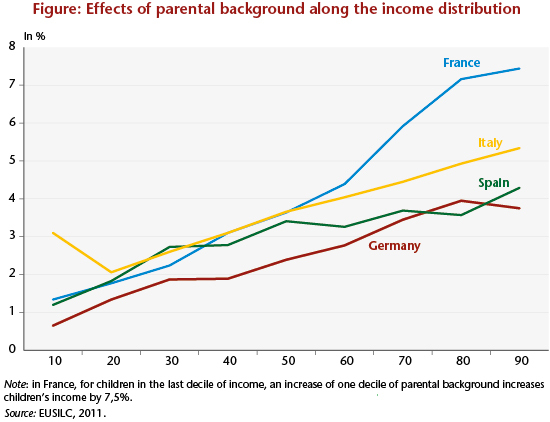 Second, the effects of family background are significantly larger in France compared to the other three countries. While the extremely large effect in the top decile is broadly consistent with the parental influence on the probability of entering grandes écoles in France, large returns in the 7th and 8th decile indicate an increasingly polarized distribution of opportunities depending on family origins. This increasingly high social immobility correlated with children abilities questions the foundation of the French school system and cannot be accounted for by a simple private vs. public school argument. A possible explanation is residential segregation and thus a radical rethinking of school admission policy based on neighborhood of residence is needed. Targeted policies promoting the mixing of students from different socio-economic background in the same school appear in high need to allow the talented but disadvantaged children to benefit from the positive peer effect from the well-off ones. Recent policy experiments carried out in the US show that these policies are particularly effective in increasing the career prospective of disadvantaged students (see Chetty et al. 2015). See Raitano, M., Vittori, C., Vona, F., 2015, ‘The effect of parental background along the sons’ earnings distribution: does one model fit for all?’, OFCE working paper, n° 2015-18 and Applied Economic Letters, forthcoming.We use the information provided by the 2011 EU-SILC wave that includes a specific section with information on family characteristics when the interviewed was around 14 years old. We build a comprehensive measure of family background combining various family characteristics (mainly educational and occupational attainments of the parents) to obtain a distribution of parental social positions and associate each child to a given social position ranked from one to ten for convenience. Note that the parental background coefficient is always statistically different from zero, apart from in the first decile in Germany and Spain. Note that in the previous wave of the EU-SILC survey on intergenerational mobility, France displayed lower intergenerational inequality than Italy, Spain and the UK. ← The American dream (finally) proven?